Veterans Association, or VA, benefits are a range of financial programs aimed at providing, among other things, educational and training support for currently serving and ex-servicemembers. VA benefits can help you cover the cost of furthering your education and skills through financial aid towards tuition, housing, training, and other related expenses. The VA education and training benefits you may be eligible for depends on your term of service. Listed below are those programs designed to provide educational and training support and their eligibility requirements. What Will VA Education And Training Benefits Cover? There are several different programs that you might be eligible for, each providing slightly different support. But generally VA education and training benefits will cover your tuition and fees, provide you a monthly housing allowance (depending on eligibility) and an annual books and supplies stipend. 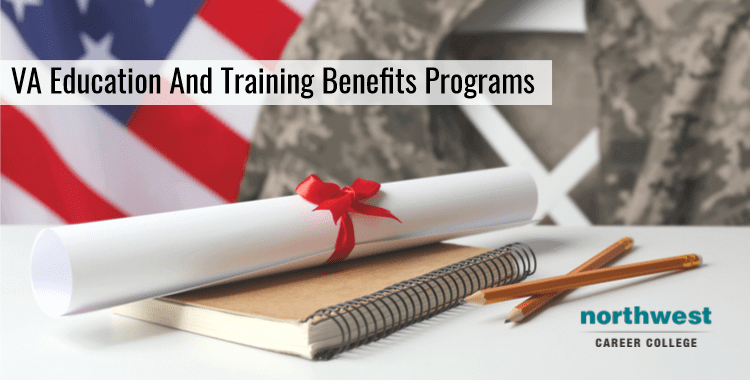 Which VA Education And Training Benefits Programs Am I Eligible For? To qualify for support under Post-9/11 GI Bill you must have at least 90 days of aggregate active duty service after September 10th, 2001, and are still on active duty, or if you are an honorably discharged Veteran or were discharged with a service-connected disability after 30 days. If you were released from active duty was before January 1st, 2013, there is a 15-year time limitation for use of these benefits. If your last discharge date is on or after January 1, 2013, the time limitation has been removed. You can find more information on the Post-9/11 GI Bill here. The Montgomery GI Bill is designed to provide support for Servicemembers on active duty and Reservists in pursuing higher education degrees, certificates, and other education and training. The MGIB supports those who enlist in the U.S. armed forces through two main programs. Montgomery GI Bill Selected Reserve – Reservists with a minimum six-year obligation in the Selected Reserve and who are actively drilling may receive up to 36 months of education benefits through the Montgomery GI Bill Selected Reserve. You may be eligible for support under the MGIB if you have an honorable discharge AND you have a high school diploma, GED or in some cases 12 hours of college credit. Because it is a buy-in program, your eligibility for the MGIB depends on your conditions of service. Find out more about the MGIB here. In addition to providing support for currently serving and ex-servicemembers, VA educational and training benefits can also be applied to their spouses and dependants through a select number of programs. Marine Gunnery Sergent John David Fry Scholarship – The Fry Scholarship provides Post-9/11 GI Bill benefits to the children, if they are over the age of 18, and surviving spouses of Servicemembers who died in the line of duty while on active duty after September 10, 2001. Find out more about the Fry Scholarship here. Dependents Education Assistance Program – The Survivors’ and Dependents’ Educational Assistance (DEA) program offers education and training opportunities to eligible dependents of Veterans who are permanently and totally disabled due to a service-related condition or of Veterans who died while on active duty or as a result of a service-related condition. Find out more about the DEA program here. Transfer of Post-9/11 GI Bill to Spouse and Dependents – The transferability option under the Post-9/11 GI Bill allows Servicemembers to transfer some or all unused benefits to their spouse or dependent children. The request to transfer unused GI Bill benefits to eligible dependents must be completed while servicing as an active member of the Armed Forces. Find out more about the options for transferring your Post-9/11 GI Bill benefits here.